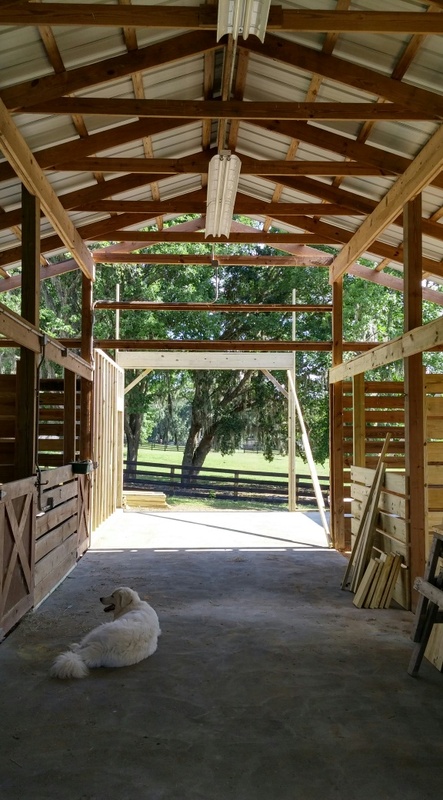 Work is steady on the barn. It’s still all about the framing, but the roofer stopped by today with a sample of the roof color (check) and the electrician and plumber should be by in a day or so to confirm finish plans. Part of the framing process adds to the structure, but part takes away. 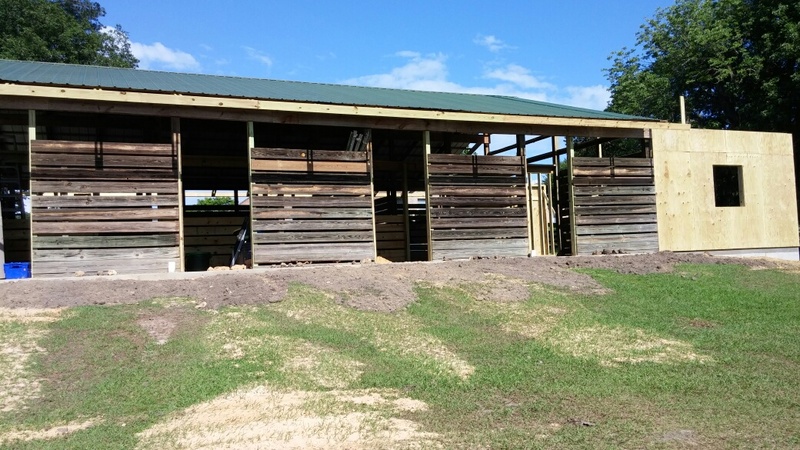 Openings now exist in the west side of the barn for the four new stalls which have been framed up inside. It gives me such a sense of relief to see that space being defined — safe harbor for everyone. Of course, it’s still pretty rough without siding or doors yet. We met our neighbor to the north in a friendly chat over the fence and he commented about our work on the “corn bin”. We had to chuckle. It does look like a corn bin, more than a barn, but that is changing. During the week, I skitter around the edges of the barnyard with no sense that this is my space. They…the framers…claim it all, as well they should. It is a project, their project, and I am a bystander. 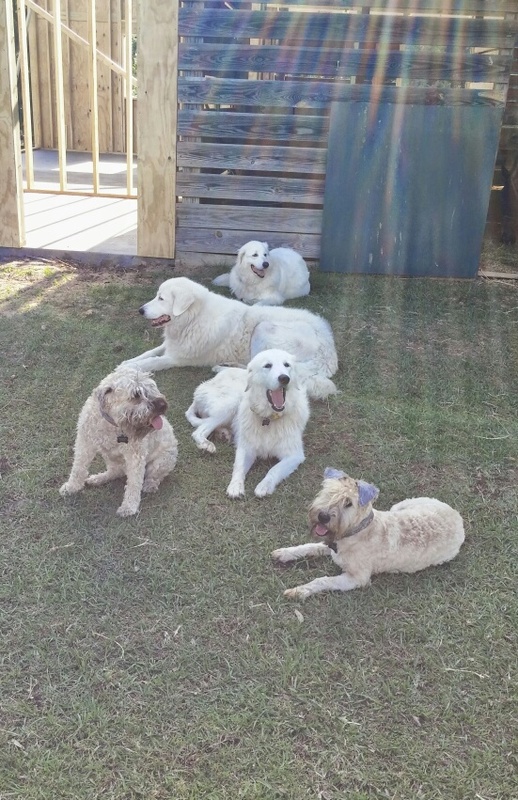 The horses and the dogs have resigned themselves to the idea that the space is not available to them, although it bothers the dogs that I go in there without them. I underestimate how much it means to them to do their job which, in most cases, means being where I am. 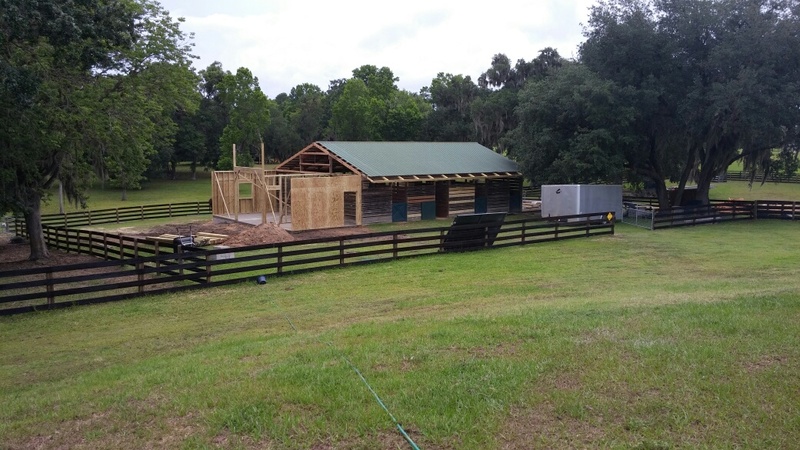 This weekend, we pulled the tractor in, filling in the moat around the newly set foundation and, because it is the weekend, the framers have stored their gear and secured wood piles. All of this makes it safe enough to let the dogs in and their joy is boundless. It takes a full hour for them to exhaust their curiosity about the changes. When they finally collapse in the shade of the east wall, I realize it is the first time I have been able to capture a “family” picture of all of them, open mouths and tongues hanging. Delightfulness. 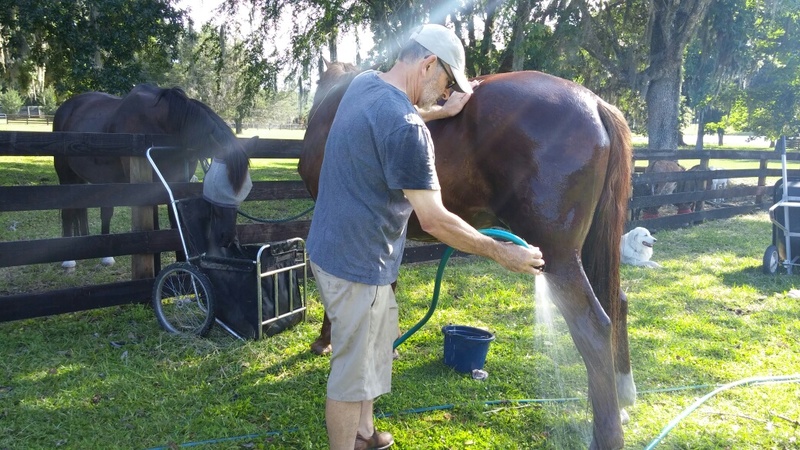 We found a way to give the horses a change of pace as well. We piled a cart high with hay and alfalfa and brought each of them into the barnyard for some one-on-one grooming time. Note that Beamer felt clever enough to avail himself of the food without the benefit of the grooming, but that’s just Beamer. It’s hot and they get sweaty and itchy. The bath feels good to them and the chance to be alone with them feels good to us. Alas, the donkeys get groomed only. They hate getting wet and my good intentions in calling it a spa treatment do not fool them, not one bit. 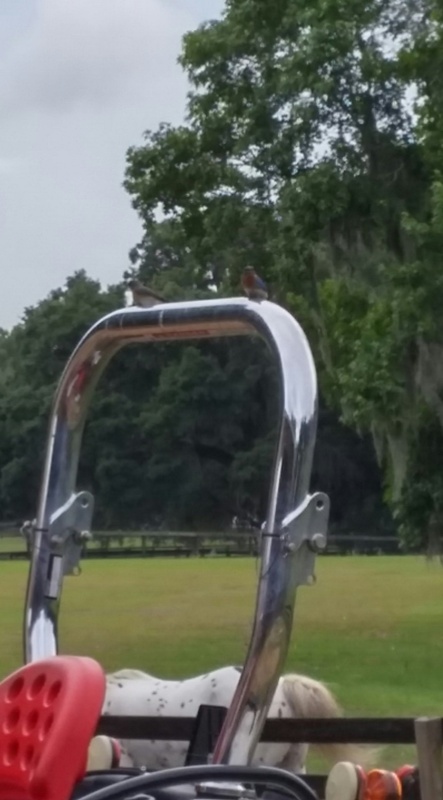 The mama and daddy birds waiting. Do you see them? It’s the mama AND daddy bird! They are waiting for us to finish our work so they can go back and tend to the nest. Also, that is not the only nest that we are nursing along. The workers found another one up in the rafters when they were removing the gable siding. They carried it down and we snuggled it into a space as close to the original nest site as we could. I haven’t been able to track this mama, but I am hoping she sticks with us through these changes. It sings barn to me. I cannot wait for that first rainy day after we are in. The barn is buttoned up tight, everyone is in their stalls, but they swing their heads out to the aisle and knicker to me as I walk down the aisle. Everyone okay? Need anything? 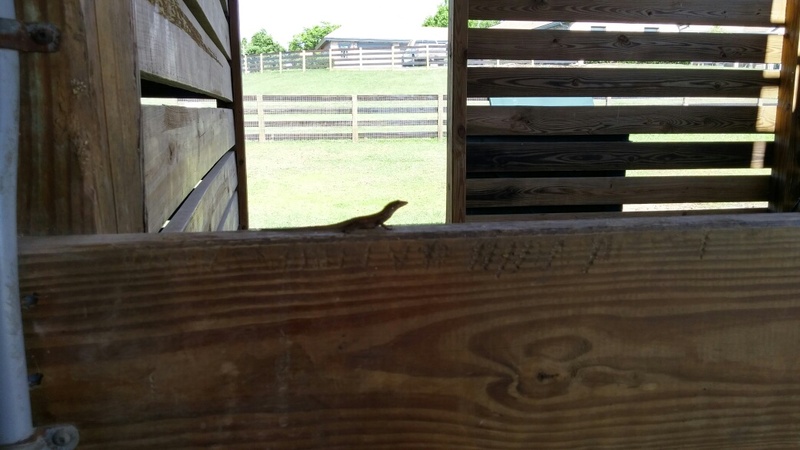 We are all well and safe — the horses, the birds, and this little fellow, too. Whomever needs shelter until the storm passes and life resumes. We are all waiting. Again—-great! Loved the pictures of the progress and how it moves along, and the “furry family foto” is delightful!